Douglas Brooks, a boatbuilder, writer, and researcher who specializes in the construction of traditional wooden boats, will be giving a public lecture at the Apprenticeshop on February 28th, at 6pm. He will talk about his experiences apprenticing with some of the last Japanese boatbuilders to learn their traditional craft. Brooks has apprenticed with seven boatbuilders in Japan since 1996, building over a dozen types of traditional boats. 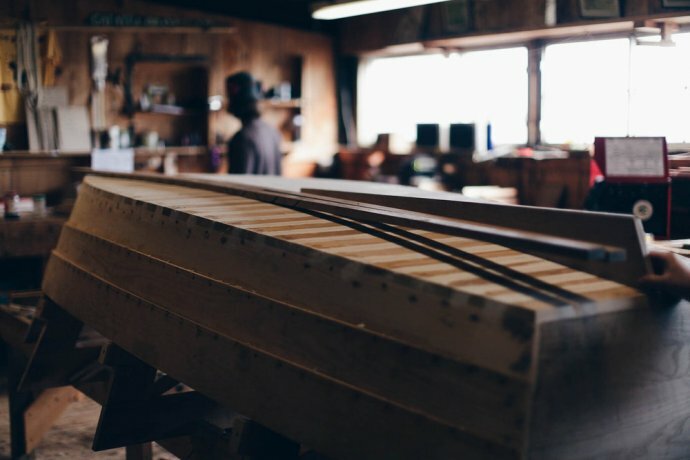 On February 28th, 2018 he will share his experiences learning the traditional craft of Japanese boatbuilding at the Apprenticeshop in Rockland. Brooks has made twenty trips to Japan since 1990. His research focuses on the techniques and design secrets of the craft. These techniques have been passed from master to apprentice with almost no written record. Brooks will also talk about the nature of craft education in Japan. The way craft is taught there represents an ethic that is largely at odds with our notions of teaching in the West. The apprentice system produced craftspeople with incomparable skills, yet it required an intense devotion and seriousness from participants. Brooks has experienced first-hand what it is like to learn when the apprentice is forbidden from speaking. At the core of this process is the belief that one learns by observation and perseverance. Brooks apprenticed in Gifu, Japan, where he built a 42-foot cormorant fishing boat working alongside an 85-year old boatbuilder. These boats are still used by a handful of fishermen who continue a thousand-year-old tradition of fishing with cormorants. In 2015, Brooks apprenticed with the last boatbuilder active in the region struck by the 2011 tsunami. There he documented the most common small wooden fishing boat of the Tohoku region, an area that saw 90% of all boats destroyed in the disaster. Douglas Brooks is a boatbuilder, writer and researcher who specializes in the construction of traditional wooden boats for museums and private clients. He worked in the Small Boat Shop at the National Maritime Museum in San Francisco from 1985-1990 and has since built boats at museums in Japan and across the United States. He teaches classes in boatbuilding and has written regularly for magazines like WoodenBoat. His most recent book, Japanese Wooden Boatbuilding (Floating World Editions, 2015) is the first comprehensive survey of Japanese boatbuilding, spanning his first five apprenticeships and including a chapter on Japan’s last traditional shipwright. Brooks will sell and sign copies of his book after the talk. Brooks attended the Williams Mystic Seaport Program in American Maritime History, and he is a 1982 graduate of Trinity College (B.A. Philosophy) and a 2002 graduate of the Middlebury College Language School (Japanese). In 2014 he was awarded the American Craft Council’s Rare Craft Fellowship Award. He lives with his wife Catherine in Vergennes, Vermont. To see photos of his boats and learn more about his research, please visit: http://www.douglasbrooksboatbuilding.com. Entrance to the lecture costs $10. For more information, please contact Journeyman Nina Noah at 207-594-1800 or via email at ninanoah@apprenticeshop.org. For more information on The Apprenticeshop’s programs, please visit our website http://apprenticeshop.org/ or contact Office Administrator Rachael Turcotte at 207-594-1800 or via email at info@apprenticeshop.org.